Dallas Cowboys wide receiver Allen Turns catches a pass as Philadelphia Eagles defensive back Corey Graham defends in the second quarter. 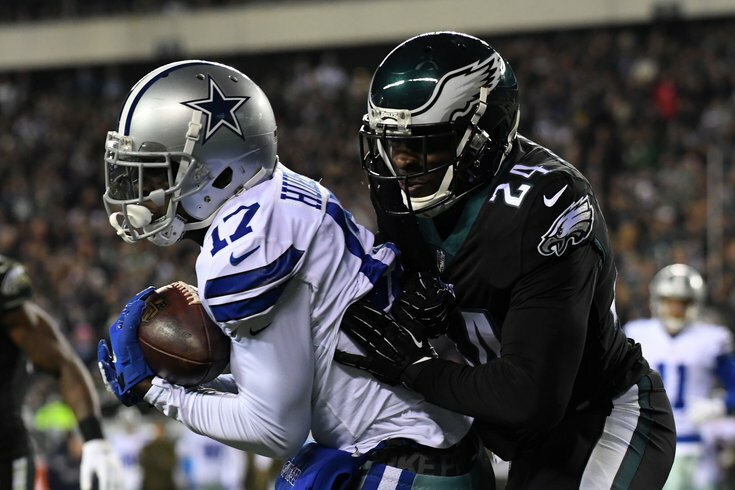 The Philadelphia Eagles will take on their hated division rival, the Dallas Cowboys, in an extremely important NFC East matchup on Sunday Night Football. The Eagles are coming off their bye, while the Cowboys come into Philly on a short week after losing Monday at home to the Tennessee Titans. As usual, the Eagles list a number of starters on their injury report, in addition to a laundry list of players already on IR/PUP/NFI. The Cowboys, meanwhile, have quite a few significant players of note who will be out for this game as well. You can find the Eagles-Cowboys injury report with analysis here. Eagles mailbag: Where will Sleevie Wonder (a.k.a. Sam Bradford) end up in 2019? As we noted in our five matchups to watch, the Eagles must find a way to stop Ezekiel Elliott and the Cowboys' rushing attack, and make recently ineffective quarterback Dak Prescott throw to his collection of JAGs at wide receiver and tight end, while getting their pass rush going against an injured and overrated Dallas offensive line. On the other side of the ball, the Eagles would be wise to give banged-up Lane Johnson additional help against game wrecker Demarcus Lawrence. After a tough win over the Jacksonville Jaguars before their bye, the Eagles have gained more confidence in their season outlook from the media and fan base. The Birds are favored by 7 points in this game, marking the ninth straight game they've been favored this season. Here are our staff writer picks, as well as who other publications are picking.